The purpose of the PEAR project is to investigate the possibilities of using Augmented Reality technologies to increase public engagement. In contrast to the nowadays "normal" mode of online engagement with public matters that takes place at a distance, we explore more situated contexts where information is provided and interaction takes place at the relevant physical location. The PEAR framework, short for Augmented Reality for Public Engagement, aims to allow the public to participate in discussions, or be informed about issues. People can physically go to a particular location, and use their mobile devices to access on-site an Augmented Reality (AR) visualization. This visualization can represent results of an online voting process or data collected by various sensors, and is updated live as more people participate or additional data is collected. 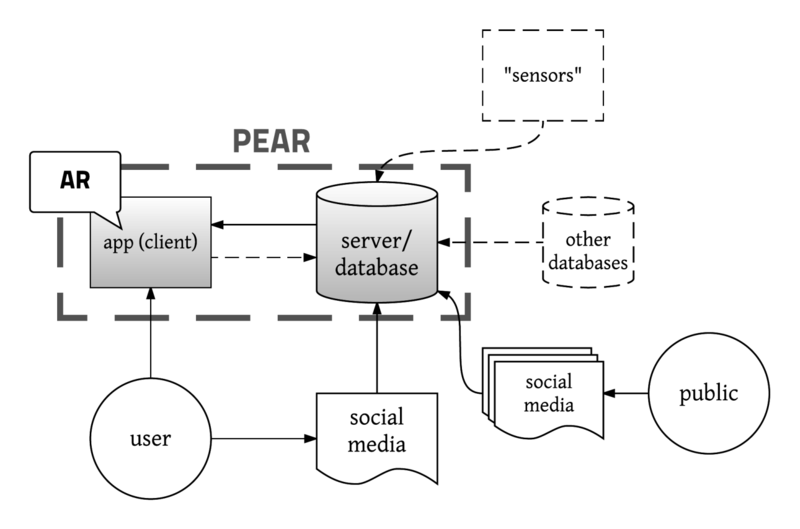 Architecture illustration of the developed PEAR system. PEAR is motivated by the objective to provide people with information and/or debate updates at a specific site to which a public issue is related. It is true that people can also obtain such information online, but this is at a greater, both geographical and psychological, distance. We believe that providing people with access to "live" information in-situ encourages participation and engagement, and also allows them to reflect from a closer, more involved perspective. A pilot study ran in May-September 2016 as PEAR 4 VXO in collaboration with the municipality of Växjö, related to the ongoing public debate regarding future development of the Ringsberg/Kristineberg area in Växjö. The public was invited to vote about this issue by using specific hashtags on Twitter (e.g. include #parkRK in a tweet to @vaxjokommun). People could also visit the physical location, use their mobile devices to scan an information poster that was placed there, download the AR app from Google Play, and view (in AR) a visualization that represented how many votes were cast for each option. This visualization was live and updated as long as people kept voting. See the news item New smartphone app aims to increase public engagement in local issues. A second study was conducted during the 1st International Digital Humanities Symposium, organized at Linnaeus University in November 2016, as PEAR 4 DigiHum. The AR application is developed using the Unity3D game engine and utilizes the Vuforia SDK for the application's AR features. The server and database, based on Node.js and MongoDB, enable the aggregation of data from social media sources such as Twitter, as well as process and provide the data to the AR application. The project is carried out within the VRxAR Labs research group.